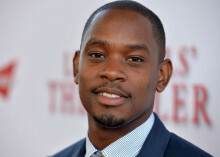 Aml Ameen (pronounced Am-el) was born the 30th July 1985 in London, England. Growing up as a child Aml Ameen loved to perform. He began his career at the age of 7 when he attended the Barbara Speake Stage School in West London where he showed a passion and, more importantly, a talent for dancing singing and acting, Although he had the love for all three mediums, it was to be the latter that would secure him his first TV role in 123 Hullbaloo with Floella Benjimin. With his acting career taking off, the young Aml took a particular interest in old movies like It’s A Wonderful Life and Fred Astaire movies, but it was watching the children’s classic Home Alone that truly birthed and cemented his dreams of becoming a successful actor. Whilst still at school he spent many years honing his performance skills, including tap dancing, singing and acting techniques. His first theatre job was playing the young Sammy Davis Jnr (age 11) in the West End production of Jolson, starring Brian Connelly. He went on to a leading role in the West End musical Oliver and had many other stage performances including touring with his own choreographed dance, inspired by the 1930′s tap duo Nicholas Brothers, and performing with Michael Jackson at the 1996 Brit Awards with Jarvis Cocker. Upon leaving school Aml’s focus completely shifted to acting and he gained a small role in ITV drama The Bill as a racially bullied teenager, returning a year later to play a villain. He also played roles in BBC’s Eastenders and Holby City and appeared in several short films. But it would be the role of Trife in the low-budget feature film called Kidulthood that changed the course of his career. Auditioning against hundreds of actors and non-actors, Aml won the role of Trife, the film’s leading man. His highly acclaimed performance and the film’s raved reviews saw Aml receive a nomination for Best Newcomer at the 2006 Screen Nation Awards and earned him a spot in The Times newspaper list for best new actors of the year. He has several new projects being released including: Disconnected (BBC), Fallout (Channel 4) and Gunrush (ITV). With an Arabic first name meaning Hope, Aml Ameen has proved that he has what it takes to go all the way. This young actor has a very bright future ahead of him in the world of entertainment. Do you want to hire Aml Ameen? Directly request a quote. In 48 hours we can send you the availability of Aml Ameen If you would like to book Aml Ameen, Entertainment Booking Agency is the right place. We will offer you the best price and contact the management or we directly contact Aml Ameen. For corporate appearances or speaking engagements you can contact our agents and the will help you true the process. Tags: hire Aml Ameen, Aml Ameen booking, book Aml Ameen, Aml Ameen appearances, find more information on booking Aml Ameen for appearances, Aml Ameen speaking engagements, Aml Ameen endorsements/spokesperson, Aml Ameen appearance fees, Aml Ameen booking agency contact info, biography of Aml Ameen, Contact an artist booking talent agent find a speakers bureau that can book Aml Ameen, speaker booking agency for Aml Ameen, Aml Ameen booking agency, Aml Ameen booking for corporate event. EBA is one of the biggest entertainment booking agencies in the World. We book hundreds of celebrities, artist, athletes and speakers in a year. Important to know is that we are not claiming to be the management of Aml Ameen. We are not the official agent for Aml Ameen. Companies from around the globe book these artists and speakers true our company be course we have one of the biggest networks and we always have direct contact with the artist or the management. We help you to find the right celebrities for your corporate of private events. Please contact one of our agents to get free advice and we will help to get the world-famous artist on your party.